Martin Eugen Ekström was born in Gålsbo, Sweden on 6.12.1887. During his adventurous life he was both a politician and an officer. The hero of the Estonian War of Independence, Colonel Ekstöm, died in 1954 in Tilkka military hospital in Finland. He was the man, who brought the first Finnish war aid to Estonia. His name will remain in Estonian war history with the remarkable events like Valkla offencive, Hara landing and the liberation of Narva from the Red Army in 1919. 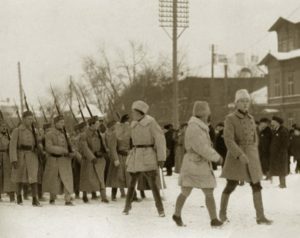 The Finnish volunteer regiment, led by Colonel Ekström reached Estonia in the beginning of 1919 and were sent right to the harsh defensive battles under Tallinn. It was highly his input, what turned the defencive into a successful offence, which led the Estonian and finnish troops to under the gates of St. Petersburg, and made the soviet side to sign the peace treaty. For those merits, the higher headquarters of Estonian military promoted Martin Ekström to colonel and he earned two Freedom Crosses for both his service and personal courage, putting him into the honorable line of the heroes, fighting for Estonian freedom. Might be interesting to know, that Martin Ekström was actually Swedish and was born in a peasant family and started his career in Uppland artillery regiment. From there and throughout his career he travelled oversees and fought for the causes he believed to be right. 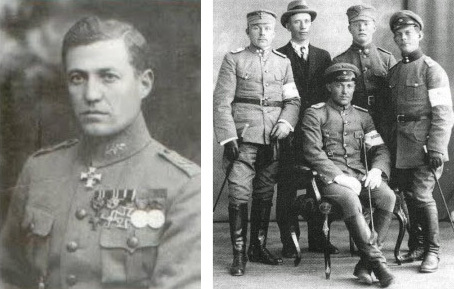 In the beginning of Finnish War of Independence, Ekström was one of the first Swedish volunteers to go to Finland, starting from a lieutenant ́s rank, which he had already earned in german-turkey war. For his enormous management skills and quick decision making ability he was promoted to major and the commander of Vaasa Regiment by the end of the war. On Christmas time, 1918, a contract was signed to send two Finnish regiments to Estonian War of Independence. The commanders were Major Martin Ekström and Lieutenant-Colonel Hans Kalm. Volunteers signed up from all layers of society and the last companies arrived Tallinn on the first days of January. Their involvement made the crucial turn in war and by the end of march, after liberation of Estonia, his regiment returned to Finland. By then, he was already promoted to Lieutenant-Colonel. After the war he stayed briefly in Lithuania as a military consultant, after that got married and moved to Finland. During Finnish Winter War and Continuation War he served as a commander of several Swedish and Finnish units. That is the story of a brave Swedish man, who fought for both Estonian and Finnish independence and united thousands of volunteers with his charisma. Both Finns and Estonians have a lot of reasons to be thankful to a brave Swedish commander who put all his effort to four different wars, Finnish war of Independence, Estonian War of Independence, Winter War and Continuation War.